As you probably know by now if you read this blog, I am a sucker for cute pictures of kids and animals. I have posted stories about dogs assisting kids with autism. 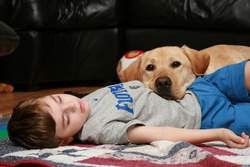 This story from Florida is about a canine companion who assists a child, Trevor Wyatt, (pictured with Kresge) who has cerebral palsy. Among his abilities, Kresge can retrieve a fallen item, such as Trevor's toys, push a door open, pull a drawer open with a rope, flip a light switch and even push an elevator button -- though there is a 50/50 chance he will push the right one. But besides the physical help he provides, he has also become the Wyatts' social bridge in a society that often shuns or doesn't know how to act when they see a young boy in a wheelchair. Children gasp in amazement when they see Kresge in a building, wondering how the dog was allowed in. "They'll ask to pet him," Trevor's mother said, "and right away, I'll make sure to introduce Trevor." The dog helps people acknowledge him as a person, as opposed to just staring, she said. Talking with strangers seems to help her son maintain eye contact and better head control so he can see what is happening around him. Some radio stations drop "The Savage Nation"